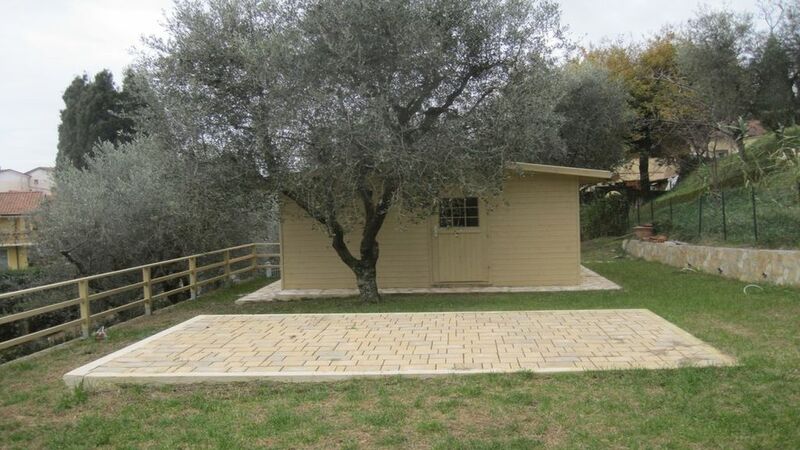 Beautiful independent wooden chalet located in the middle of olive trees with a large garden and private parking. Externally equipped with a gazebo for outdoor lunches and dinners. Equipped with every comfort, ideal for individuals or couples, guarantees peace and privacy. A few kilometers from the sea and from the cities of art like Lucca, Pisa, Siena, Florence allows you to stay in the Tuscan countryside and savor the beauties of the local tradition, both of the table and of the rooms. Staying in the chalet you can go walking, cycling, horseback riding along country roads in the woods far from cars or motor vehicles. Free Wifi. Das Chalet hat eine entspannte ruhige Lage außerhalb des Trubels, allerdings benötigt man unbedingt ein Auto und selbst dann stellt die Fahrt zum Grundstück eine kleine Herausforderung dar. Doch ist man angekommen, kann man nette Abende im Garten und auf der Terasse ausklingen lassen und den Grillen zuhören. Das Chalet ist mit viel Liebe eingerichtet, allerdings könnten noch einige Details zum Kochen ergänzt werden (scharfes Messer, Salz, Pfeffer,...). Das Wifi funktionierte leider bei uns nicht, Empfang war nicht wirklich dafür vorhanden. Für den Preis aber absolut toll! Mit dem Auto waren es nach Lucca 45 min., Pisa eine Stunde und nach Florenz 90 min. Die Strände in Viareggio waren schön und kostenlose Parkplätze konnte man auch finden. We had a great stay in LaBastide. The owner welcomed us very kindly and told us a lot of information about the citys around Massarossa. We visited some of these places and we enjoyed it. The house LaBastide offers enough space for two people. The kitchen is completly equipped so you can cook. If you want to travell in autumn like us you can use the heating to ceep the rooms warm. Nous avons loué la bastide pour une semaine, parfait pour deux personnes. L'accueil fut très chaleureux par paola et aldo. Même si il ne s'agissait que d'un chalet nous avions une terrasse afin de profiter pleinement du beau temps toscan. Nous le recommandons sans hésiter ! Encore un merci à nos hôtes très sympathiques. Et peut-être a bientôt ! Merci beaucoup. Nous vous attendons l'année prochaine ! Regional cuisine. Typical Tuscan restaurants with fish and meat menus. Regional cuisine. From Bargecchia you can quickly reach all the cities of Tuscany (Pisa, Lucca, Florence, Siena, Arezzo, Volterra, San Gimignano) and get comfortably with the highway to Rome.